Prix de L’Arc de Triomphe Betting: Can Enable be Beaten? 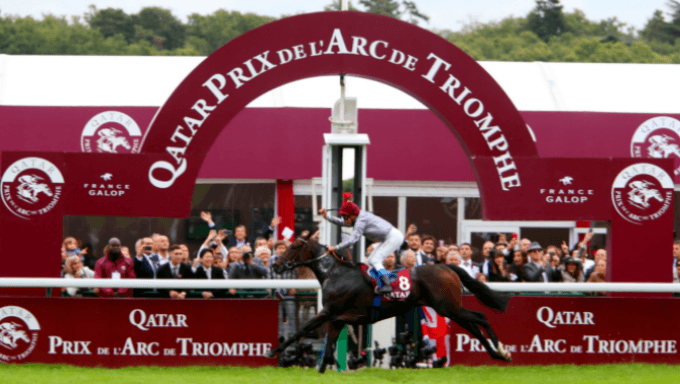 The Prix de l'Arc de Triomphe, currently sponsored by Qatar Racing and Equestrian Club, is a Group 1 contest run at Longchamp over a distance of 2,400 metres (about 1½ miles), open to three-year-olds and upwards, and scheduled to take place on the first Sunday in October each year. Generally referred to simply as the "Arc", it is Europe's most prestigious Flat race, and since QREC's sponsorship, the value of the race has more than doubled to €5M. The race was inaugurated by the The Société d'Encouragement in 1920, and designed as a championship event, with the name taken from the famous monument situated across the Bois de Boulogne from the racecourse, and a popular focal point for Parisians in the wake of World War I. The Arc was cancelled twice during World War II, in 1939 and 1940, and was run at Le Tremblay over a distance of 2,300 metres (1m3½f) in 1943 and 1944. In the last two years, the racecourse, now renamed Paris Longchamp, has been redeveloped, with the race run over its usual trip at Chantilly in 2016 and 2017. The beauty of the Arc is that its prestige means that few horses capable of taking the race are earmarked for other races, and even at an advanced stage, the race can be narrowed down to the cream of the crop who are proven over the race distance. The race has been dominated by the younger brigade and only two horses older than four have won since 1975, with three-year-old fillies, in receipt of weight allowances for both age and gender, faring particularly well. On the negative side for ante-post punters, the draw at Longchamp can be a big factor, and the uncertainty of not having this information needs to be balanced with the price attained. The winner can come from a myriad of sources given the international nature of the race, but the Trials day at Longchamp featuring the Prix Vermeille, Foy and Niel has been historically significant. There have been a number of dual winners of the race, although Treve’s win in 2014 made her the first to win back-to-back renewals since Vincent O’Brien’s Alleged in 1977/78 (Sagace was twice first past the post, but was disqualified in 1985). Enable attempts the same feat as Treve, and while a knee injury in the spring threatened to put her participation in jeopardy, she looked as good as ever when beating Crystal Ocean, who’s 20/1 to win L’Arc de Triomphe at Black Type, in the September Stakes at Kempton. Her handler is a master in the art of target training, and she goes to Paris both in top form and fresher than most of her rivals, so looks a rock-solid favourite. The latter also deserves a mention, as he was conceding 5lb more than he will in October due to the penalty conditions of the September Stakes, and it seems a bit strange that he was eased in the market for what was a perfectly adequate display at Kempton. Sea of Class, 6/1 at Coral, fits the traditional bill of being an improving three-year-old filly who is a Group 1 winner over the trip, landing both the Irish Oaks and the Yorkshire Oaks, as Enable did last year. Unlike Enable, she has been spared the rigour of contesting the Oaks and Epsom and the King George, so she doesn’t have last year’s heroine’s lustre coming into the contest, but she could be hiding a little more as a result. Like John Gosden, William Haggas doesn’t get it wrong very often, and as a daughter of Sea The Stars who races for the Tsui family under the banner of Sunderland Holding Inc, it can be assumed everything she has done has been building towards winning this race like her sire, and her sire’s dam, Urban Sea, who landed the Arc 25 years ago. Cracksman, who’s 7/1 at Paddy Power, is a contender on last season’s form, but has questions to answer after labouring to land the Coronation Cup and was left behind by Poet’s Word at Royal Ascot. His stunning win in the Champion Stakes is beginning to look like an outlier, but it’s possible he is the type to peak in the autumn. Waldgeist won the Prix Foy, the key trial at the track for older horses, but in the last fifty years it’s been easier to lose the Foy and win the Arc than to win both races, and the Andre Fabre-trained 4-y-o has lost too many races to be considered a champion. Kew Gardens was impressive in the St Leger, but that race has rarely proved a good prep for the Arc, with the likes of Nijinsky and Reference Point humbled at Longchamp despite holding outstanding form claims. Alleged took in both races in 1977, but was surprisingly beaten at Doncaster before winning the first of his two Arcs. Kitesurf, 16/1 at Paddy Power, was a narrow winner of the Prix Vermeille, but that race lacked proven Group 1 winners, and she falls shy of the standard required. The Prix Niel threw up an interesting outsider in the shape of Brundtland, who beat Hunting Horn to maintain an unbeaten record; his profile is an attractive one, but while Godolphin have 16 horses entered in the Arc, he isn’t one of them, and has been touted as a staying prospect by Charlie Appleby, with the Prix Chaudenay over 1m7f as a possible target. He would be interesting if his connections had a change of heart and supplemented him, but is a risky bet at present. Study of Man was a big fancy early in the season, but Pascal Bary’s charge is looking a little flattered by his narrow win in the Prix du Jockey Club, and isn’t certain to stay even if turning up. There really aren’t many serious contenders if the Arc is to come up to standard in 2018, although the race does still have the ability to throw up the odd unexpected result, such as Solemia’s head-scratching win in 2012. It takes a degree of pig-headedness not to recognise Enable as much the likeliest winner, but her price is representative of what it will be on the weekend of the race, and her history of injury means she is better played when the draw becomes known. That leaves two possible bets which don’t require taking a wild swing, with Sea of Class having the perfect profile for the race, and Crystal Ocean overpriced on the back of a perfectly understandable defeat by Enable when he was conceding 8lb to that rival.